Lila de Nobili (1916-2002) was a designer of great delicacy and ingenuity. In 1968, she designed Peter Wright's production of The Sleeping Beauty for the Royal Ballet, and the surviving artefacts are little masterpieces of both imagination and craftsmanship. There were, in fact, so many visual delights that it took several viewings to realise them all. In Act III of the ballet, the guests at the wedding of Princess Aurora and her Prince include several fairy-tale characters, including Red Riding Hood and the Wolf. 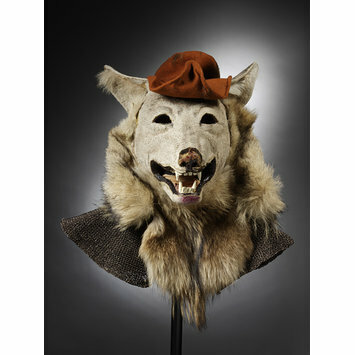 The costume for the Wolf was a glorious mix of realism and imagination, the mask intensely realistic, allied to a chain-mail tunic and tights, with a very smart little hat. This wolf's head was a superb example of animal headdress-making. 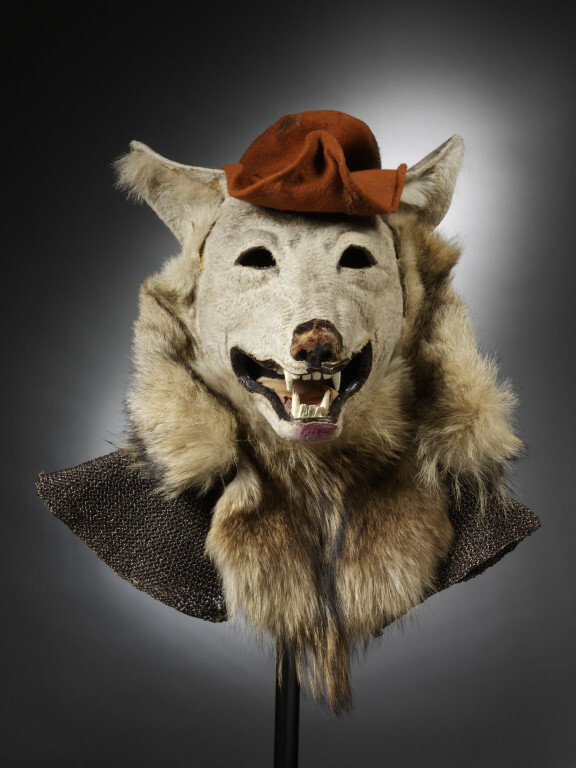 It was devised by the great mask-maker Rostislav Doboujinsky, who was later to make the headdresses for the film of Frederick Ashton's ballet Tales of Beatrix Potter. Dancing under the heat of stage lights is uncomfortable, and having to wear full head mask is not popular with the performers, so the masks have to be as light as possible and give some ventilation. By the 1960s, new materials allowed Doboujinsky to create heads that were substantial but light enough to be worn for long periods, give as wide an angle of vision as possible and try to ensure that the wearer did not overheat. Costume for the Wolf worn by Ronald Plaisted in Act III of Marius Petipa's ballet The Sleeping Beauty, Royal Ballet, Royal Opera House, Covent Garden, 1968. It was intended that this new production, staged by Peter Wright, should have a different 'look' to the Royal Ballet's famous former Sleeping Beauty designed by Oliver Messel. New and additional choreography was provided by Frederick Ashton. The 'Medieval' settings were designed by Henry Bardon, the costumes by Lila de Nobili and Rostislav Doboujinsky. The production was not considered a success, and was replaced by Kenneth MacMillan's new version in 1973.